This rainy afternoon I settled down in my reading chair and snuggled in with both of my kids to read Count Your Chickens by Jo Ellen Bogart. The book was perfect for both my children (aged 2.5 and 6). It captured their attention with the sing-song like rhymes and vibrant illustrations. Even my youngest enjoyed the finding the chickens in their funny outfits in their exciting locations. These chickens have a ball riding trains, ferris wheels and much more. 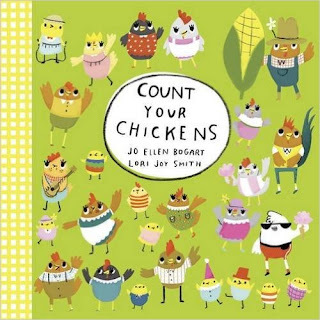 Your children will love laughing along as you read, finding and counting the chickens. Any book that combines silliness and learning is a hit in my house! Add in chickens in clothing and you have a sure winner. I highly recommend this book to families with little ones – or anyone who is just a fan of chickens. You can purchase this book on amazon. This is an affiliate link. Thank you for supporting my blog! Perfect! Looks like a cute book! I immediately read this one and thought of Kris. If I had the actual copy and not an ebook, I'd pass it right along to her. Yay for sitting in car line, browsing your blog and finding this! Just ordered it for an Easter basket :) you know we love our chickens!